Tae Kwon Do is a Korean martial art that traces its history back to ancient Korea as far as 50 B.C., when it was known as Taek Kyon. The art itself has evolved with time, and in the last century became known officially as Tae Kwon Do. Translated literally, Tae Kwon Do means "the way of hand and foot" or, "the art of kicking and punching". As its popularity spread across the globe, the World Tae Kwon Do Federation was created in order to coordinate all of the schools around the world. Tae Kwon Do is now an Olympic sport, and tournaments have been featured in the past three Olympic Games. Today, Tae Kwon Do exists as the combination of many ancient disciplines that have been combined into an effective martial art. Tae Kwon Do is practiced throughout the world as a means of achieving physical fitness, and personal growth. Through the spirit and philosophy of Tae Kwon Do that is rediscovered in some new way during every class, students grow in ways that they may not expect when they first begin. Students train their bodies by becoming more aware of their own movements, and developing their own stamina, flexibility, and strength. Students train their minds by improving their own understanding of the art, its tenets and its philosophy. Grand Master Yee often welcomes a new class of students by explaining to them "I'm going to make you strong and smart." These two go hand in hand, and Tae Kwon Do emphasizes each of them in developing the whole student. 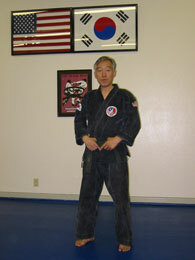 Grand Master Young Yee at his school in Torrance, California. The Kukkiwon, the headquarters of the World Tae Kwon Do Federation in Korea.